It's the 6 degrees of separation thing. When great kids blogger Maddie from lil magoolie contacted me, we had no idea that we went to the same school, that I was in the same class as her brother and that she was on the debating team with my sister! Since then Maddie has lived in Vancouver, and is now based in Christchurch, New Zealand where she writes about fantastic finds for Mums and kids. Maddie is also a designer and her site is full of colour, fabulous fonts and glorious illustratative squiggles. 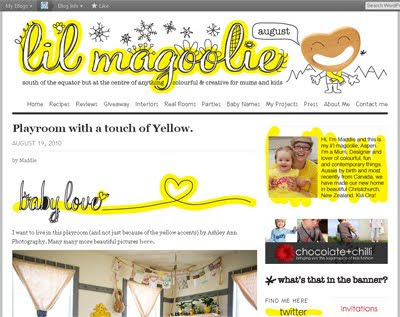 Check out lil magoolie for recipes, reviews, real rooms, interiors, parties and some help with baby names, as well as any other fabulous tidbit that Maddie comes across. It's just a happy place to spend some time. Wow, what a small world! Love Li'l Magoolie blog and Maddie is just too fabulous. Her blog always brightens my day. Hi Kellie - I know, right! Too funny. Maddie is definitely a day-brightener. How can you not look at all that yellow and smile? 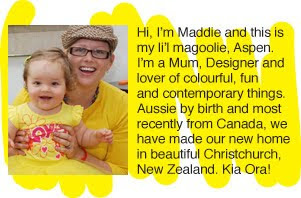 I love Maddie's blog... her posts always brighten my reader with their splash of yellow!